Sweet and mild, the persimmon is a fruit with a short harvest season in late fall. Though there are many varieties, two are most common: Fuyu and Hachiya. Fuyu is the type most of us are used to seeing, and can be eaten when firm. They look like orange tomatoes, but if you try to make a marinara from it, you’ll get some unexpected results! Hachiya have a teardrop shape and elongated appearance. They can only be consumed when very soft to the touch, otherwise their tannins will dry your mouth out. If you’ve ever thought you don’t like persimmons because you tried one and this happened, chances are it just wasn’t ripe yet. Because Hachiya require such specific conditions to eat (they’re similar to avocados in terms of a magic ripe moment before rotting), we’ll be working purely with Fuyu for these recipes. Choose Fuyu persimmons that have a well-developed orange color and just a little bit of give when squeezed. This fruit, originally from Asia, is high in vitamins A and C, as well as manganese and beta-carotene. Persimmons can be used in everything from jams to cakes, and if you want to enjoy them beyond their brief fresh season, you can buy them frozen or dried. These holiday-friendly, plant-based treats will satisfy your fruit curiosity and your taste buds! An almond-based pastry cream that’s popular in France in Christmas desserts, frangipane filling can be used in any sweet, but is most frequently found in fruit tarts. A galette is a standalone pie or tart made without a pie plate, which gives it a rustic, homey feel. If you get frustrated trying to pinch together a perfect pie crust, a galette is the solution for you! The combination of lavish almond cream, flaky tart shell, and sweet persimmon makes this pie so interesting, you’ll forget all about pumpkin or apple. 2. On a greased cookie sheet, spoon frangipane filling onto pastry dough, leaving a 1-inch border at the edges. 3. 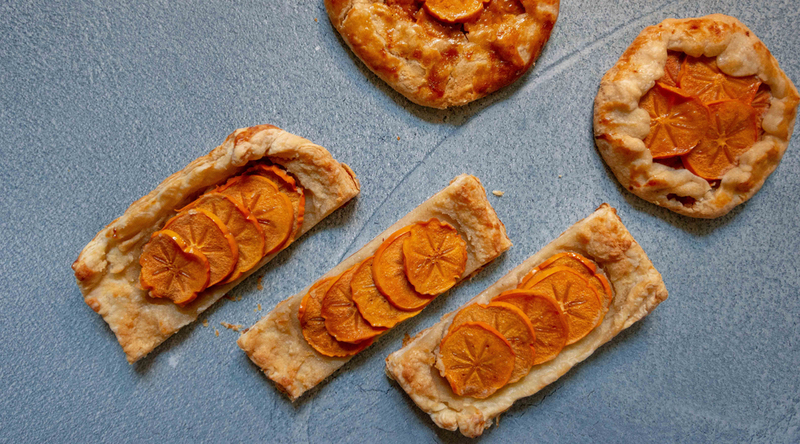 Arrange sliced persimmons on top of frangipane filling, and if using glaze, brush over top of fruit. 4. Fold sides over to create a crust. 5. Bake until golden: about 35 minutes for pie dough, or 20 minutes for puff pastry. The Old Fashioned is a classic cocktail that never goes out of style, but there’s no harm in giving it a little new life! Persimmons marry perfectly with the traditional flavors of whiskey and orange, and add an extra pop of color. Cinnamon stabilizes blood sugar (so you get a little less of a spike than you normally would from a sweet cocktail), and also adds an autumnal flavor. We swapped simple syrup or sugar for maple syrup to keep the focus on minimally processed ingredients, and add some extra winter vibes. Bourbon and rye work equally well; opt for bourbon for a sweeter, richer cocktail, or rye for a lighter, sharper one. 1. Muddle persimmon and orange peel in a cocktail shaker until persimmon is mushy. 2. Add remaining ingredients and a handful of ice; shake well. 3. Strain into a rocks glass with ice, or a coupe glass without. 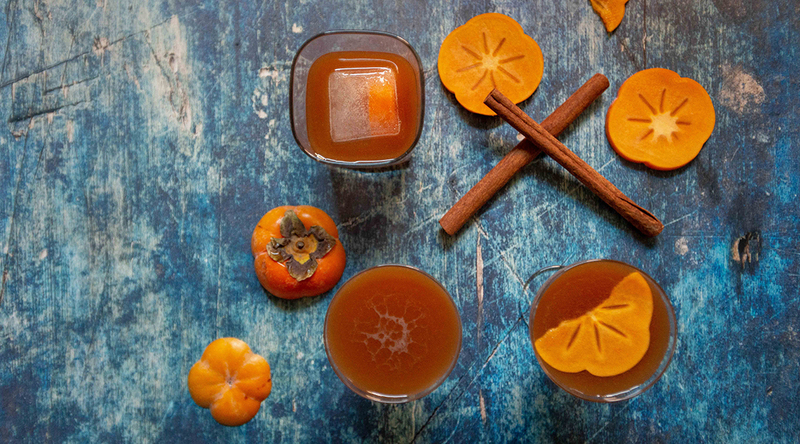 Garnish with persimmon peel, cinnamon stick, or both. 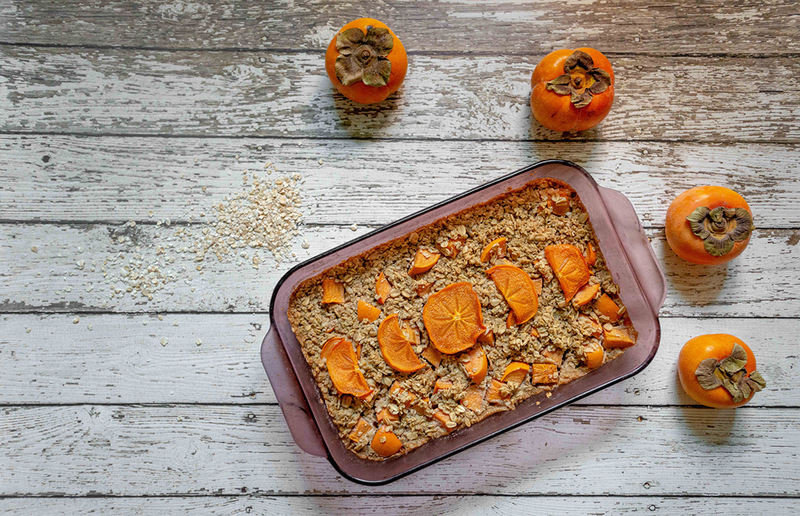 For those mornings when you want a filling breakfast without any work, baked oatmeal is your make-ahead dream come true! You can prepare the dish the night before and bake it when you wake up. It’s also festive enough for a holiday gathering; just pop into the oven to warm and you’ve got a crowd pleaser that took no pre-coffee effort. You can use quick-cook or rolled oats, depending on the results you prefer: rolled oats will yield a more rustic texture, and quick cook will give you a more custard-y one. Combine the two for the best of both worlds! Ginger adds a little zing while helping reduce inflammation. 2. In a mixing bowl, combine all ingredients, then pour into a greased 8×8 baking dish. 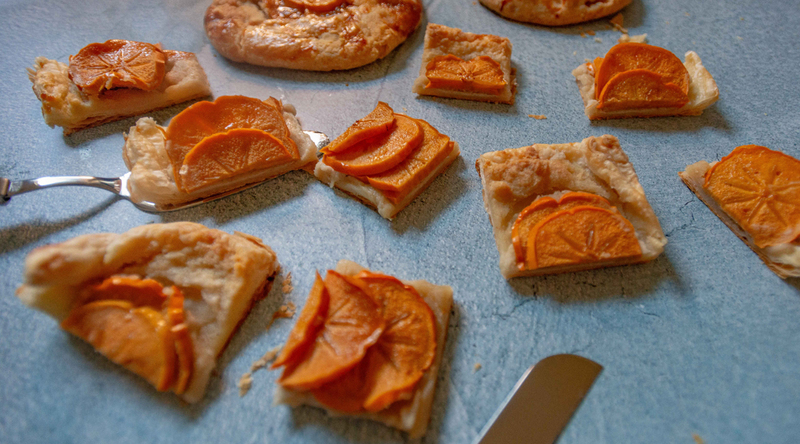 Top with persimmon slices if using. 3. Baked until firm to the touch, about 40 minutes. Plenty of salads incorporate fruit, so why not spring rolls? 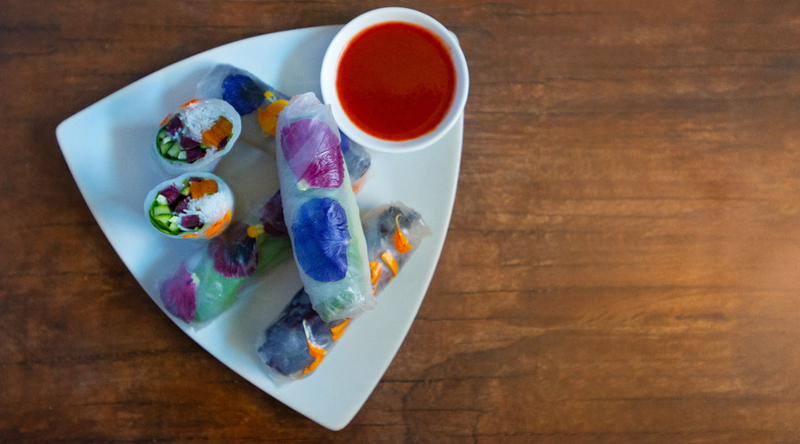 Here we add sliced persimmons to spring rolls to give this otherwise simple veggie roll a dose of excitement, and also to provide a contrast to the bright flavor of fresh mint, which is good for digestion. Pair these with a peanut or almond dipping sauce and you’ll turn a light appetizer into a substantial entrée. Prepare spring roll sheets per package instructions, then place 1/6 of each item on one side of each spring roll sheet, and roll up like a burrito. Though it’s been a staple in Eastern cultures for millennia, turmeric has only recently grown to popularity in the West. 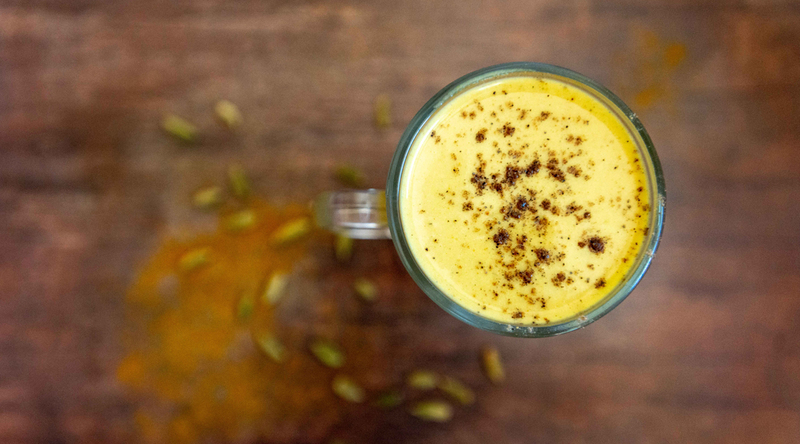 Due to its well-proven health benefits of reducing inflammation and pain, it has gained traction in a drink called “golden milk” — warm milk steeped with turmeric and other spices. This version promotes restful sleep with ingredients that help you unwind. By adding persimmon you’ll get a small boost of fiber, natural sweetness, and less of that “earthy” taste that makes many people shy away from turmeric root. This version is thick and resembles a smoothie. You can make it hot or cold. Looking to learn more about the health benefits of plant-based foods? Check out this page to learn more! That sounds so lovely. Thank you for sharing! Did you try any of these out? Let us know what was your favorite!